Walking westward from Stockbridge along the Water of Leith you first pass under the arch of St. Bernard’s Bridge (sometimes called Mackenzie Bridge). Built in 1824 it was a single span bridge across the river. 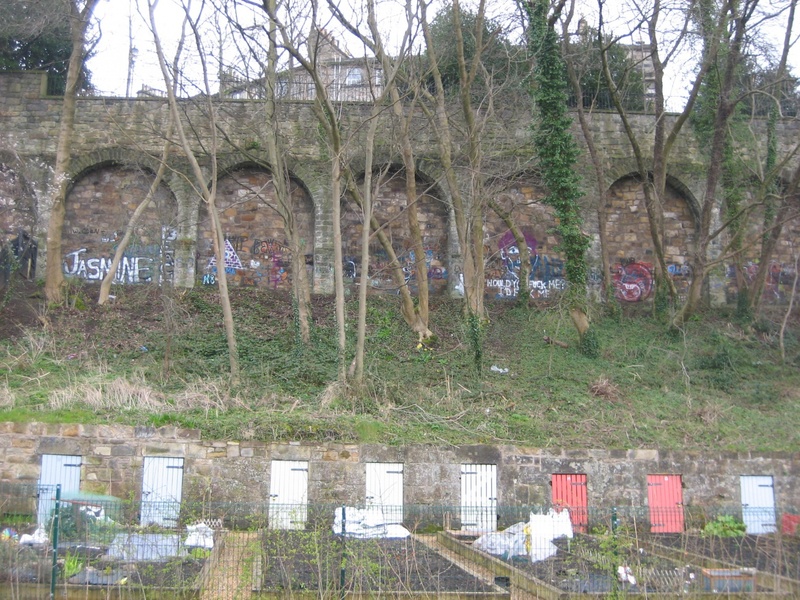 To the south there is a smaller arch, blocked-off in 1890, through which the Great Lade passed onto India Place, carrying water which powered the mills along the river as far down as Canonmills and Logie Green. The steps and added archways were built in 1887, as noted in the coat of arms above the western arch. The path splits, one going along the riverside, and one curving upwards and joining the path that comes from the bridge steps. 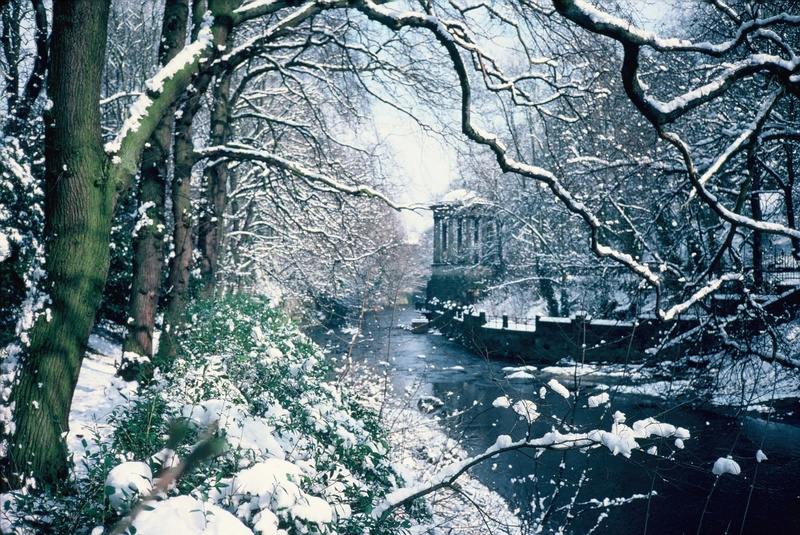 On either path you reach St. Bernard’s Well. A pumphouse, it was built over a spring discovered in the 1760s by some boys fishing nearby. 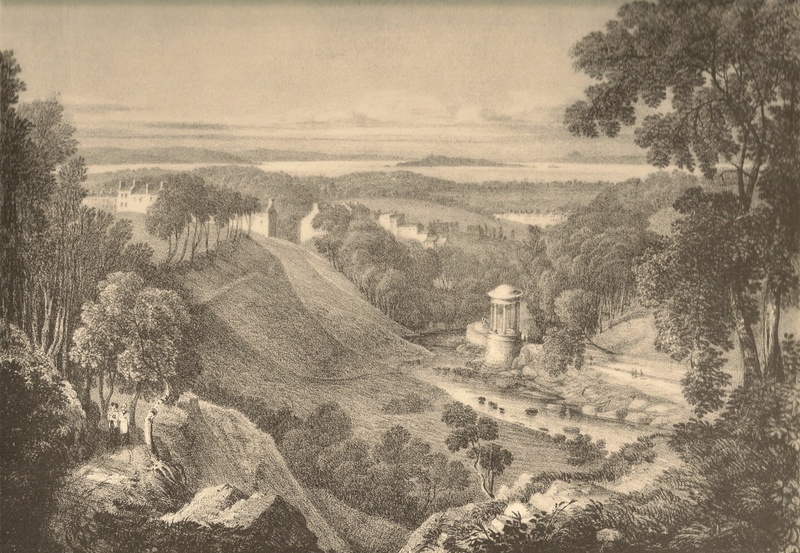 The landowner, Lord Francis Gardenstone, commissioned Alexander Nasmyth to build it in 1789. Nasmyth had been on the Grand Tour of Italy, and designed the pumphouse as a copy of the Temple to the Sybil at Tivoli, the summer palace of the Roman emperors. A circular domed temple with ten plain Doric columns within which is the statue of the goddess Hygeia. The inside was elaborately decorated by the interior designer Thomas Bonnar. The water was thought to possess health-giving properties and people came to take the waters (for a small charge). The Well later passed into the ownership of William Nelson, who refurbished the Well in 1887, and designed the surrounding walkways. There is a plaque dedicated to his memory nearby, bearing the message ”The Liberal deviseth liberal things”. Edinburgh World Heritage Trust refurbished the Well in 2012, as part of its 'Twelve Monuments' project. Visitors ask about the origin of St. Bernard. There is no evidence that a St. Bernard ever entered Scotland, or England. 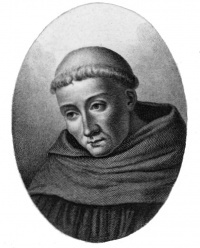 There was a Bernard of Clairvaux (1090 - 1153), who became very well-known and influential. He travelled widely throughout Europe, and was canonised in 1173. He was known to Henry I and the nobles of England. He sent monks from Clairvaux to England and Ireland, and founded many Cistercian abbeys. There is a story that a monk from the Cistercian Abbey of Culross took up residence in a cave along this part of the river. Once Lord Gardenstone had chosen the name 'St. Bernard's Mineral Well' the name was taken up for the bridge, St. Bernard's Crescent, and St. Bernard's Primary School (now residences) on Dean Park Street in the expanding Stockbridge. Notice the condition of the walkway and railings. On the upper path along from St. Bernard's Bridge a tree is growing between the verticals of the railings. 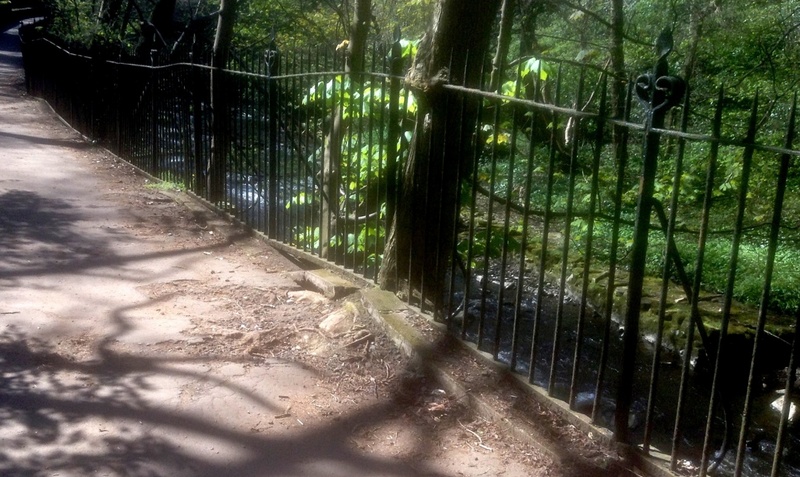 At intervals, the walkway and railings are disturbed by the roots of trees growing out of the wall that supports the walkway. Continuing along Miller Row, on your left are the Moray Place Gardens and across the river on your right are the Dean Gardens, both private areas accessed only by members. Further along the walkway, on the right, is the smaller St. George’s Well, built in 1810 by a Mr. MacDonald of Stockbridge, who named it to honour George III on his jubilee year. It was called the “Inky Well”, because of the taste of the water. 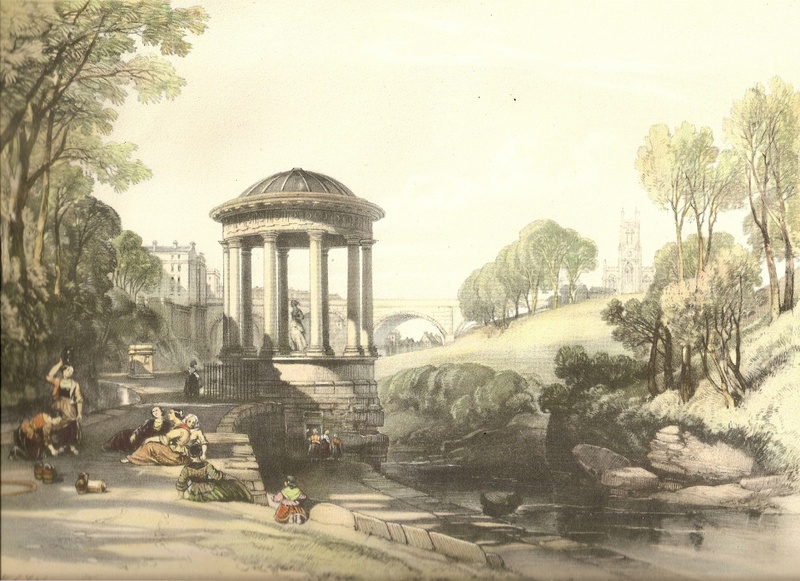 The owner hoped to emulate the popularity of St. Bernard’s Well, but did not succeed, and the Well fell into disuse. A little further on, a stone pillar and wall on the left mark the western boundary of the Moray Place Gardens. On the western side is the site of Greenland Mill, built in the 1500s. Some walls and sites of grain silos are still visible. When building started of the New Town on the hill above, several land-slips occurred, damaging the Mill and nearby cottages. A huge retaining wall was built, comprising forty-six arches, to protect the buildings beneath. The arched wall that protected Greenland Mill is obscured by vegetation. 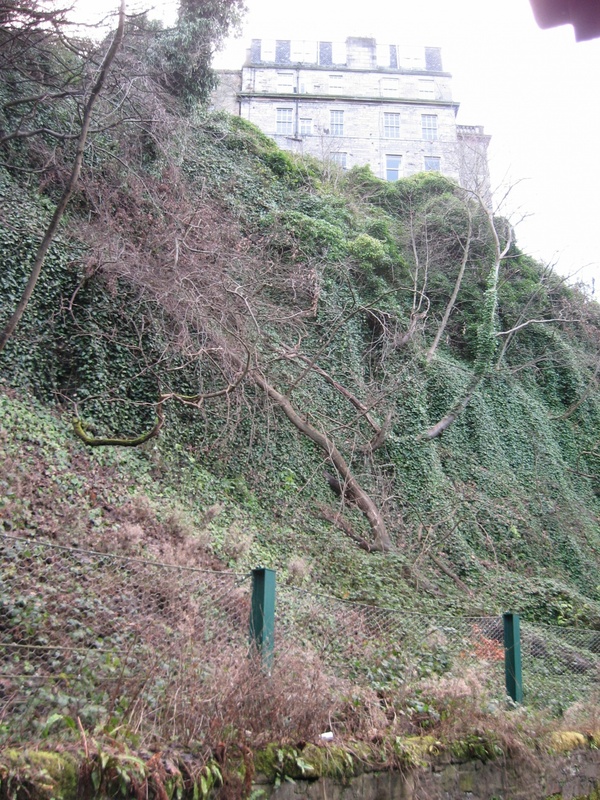 The geological strata by Dean Bridge are hidden behind thick growths of ivy. 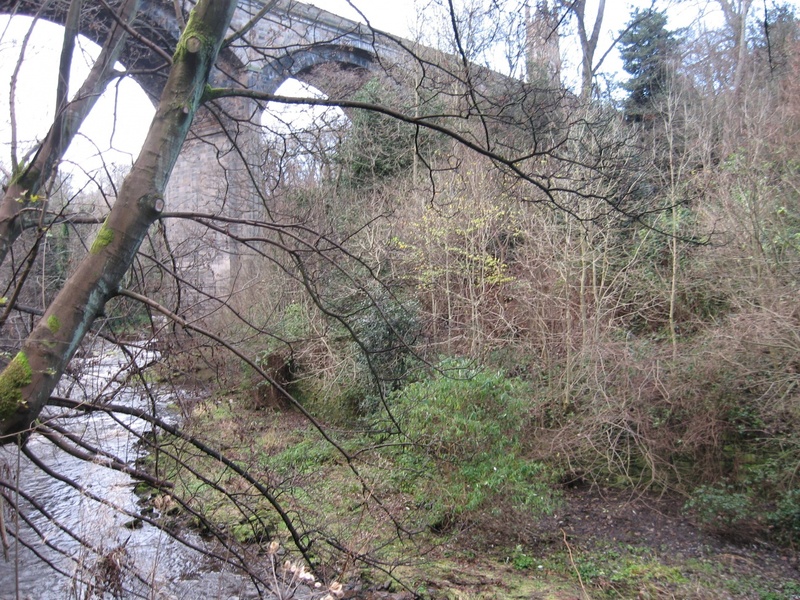 Similarly, ivy is growing on trees by the riverside on the west side of Dean Bridge. Find out how Dean got its bridge. As you approach Dean Bridge, note the rock strata on your left. The upper levels are Wardie mudstone, and the lower levels are sandstone, reflecting the past geological history of the area. The rocks merge in with the stonework by the bridge. 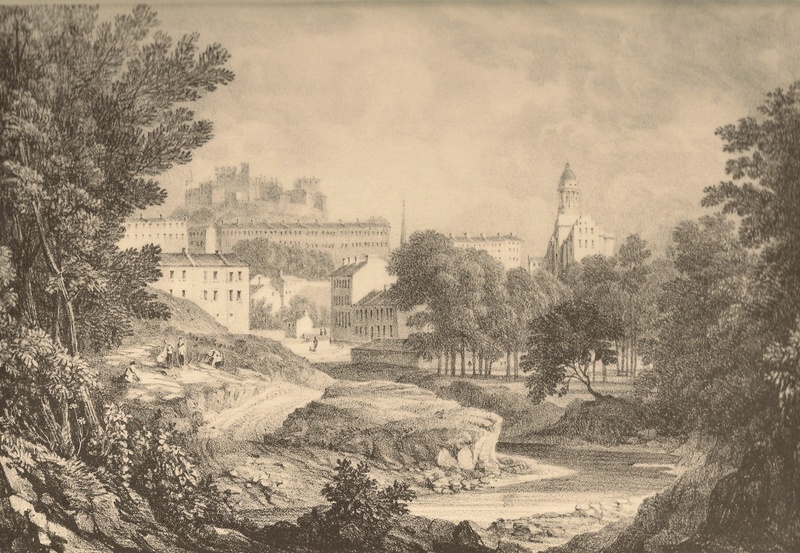 The building of the bridge was instigated by Lord Provost John Learmonth. He had extensive lands to the north of the Water of Leith, saw the New Town rising on the south side, and wished to build on his land. 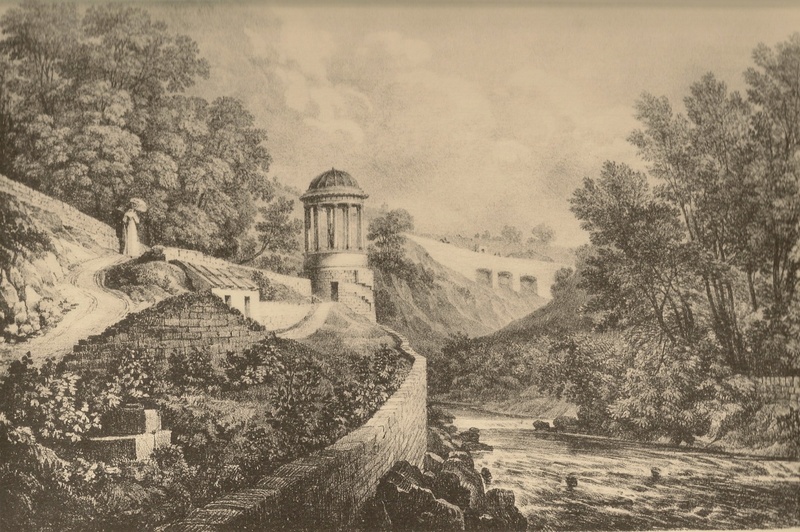 The Cramond Road Trustees agreed to put up part of the money, but insisted that Thomas Telford build and design the bridge. Note the hole in each block of stone where a grab claw held the block so that it could be lifted into place by block and tackle. The bridge was completed in December, 1831, but the chief engineer, John Gibb, did not hand it over until the appointed time, three weeks later. In the meantime he charged people one penny a time to cross. John Learmonth did not benefit immediately, and twenty years passed before Clarendon Crescent was built. At the bridge, look over the wall to the river. On the left is a rock on which is a statue of an otter. 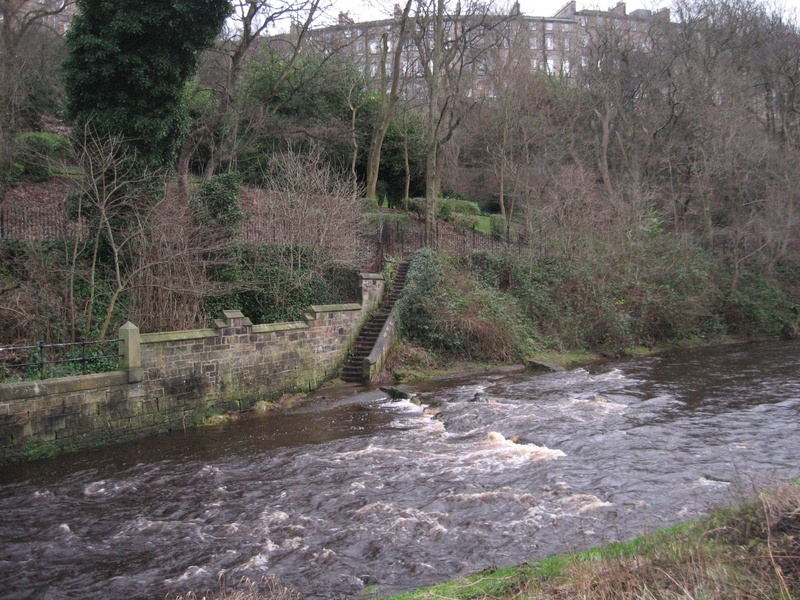 Commissioned by the Water of Leith Trust, it appeared rather mysteriously in the river several years ago. The sculptor has been identified as Stan Wilson, who retired from Scottish and Newcastle Brewery at aged 50, and then studied and took up sculpting. On the west side of the bridge is a castellated structure built by William Nelson, (who renovated St. Bernard’s Well), originally a Fives court. Now offices, it stands on the site of Mar’s Mill, built in 1560. Opposite is a gate which leads down to the river. Paths there lead under Lindsay’s Mill to the lower weir. Take care as the paths are steep and slippery. The modern building on the left was the office of RMJM Ltd, architects that assisted in designing the Scottish Parliament building. It is presently being converted into residences. 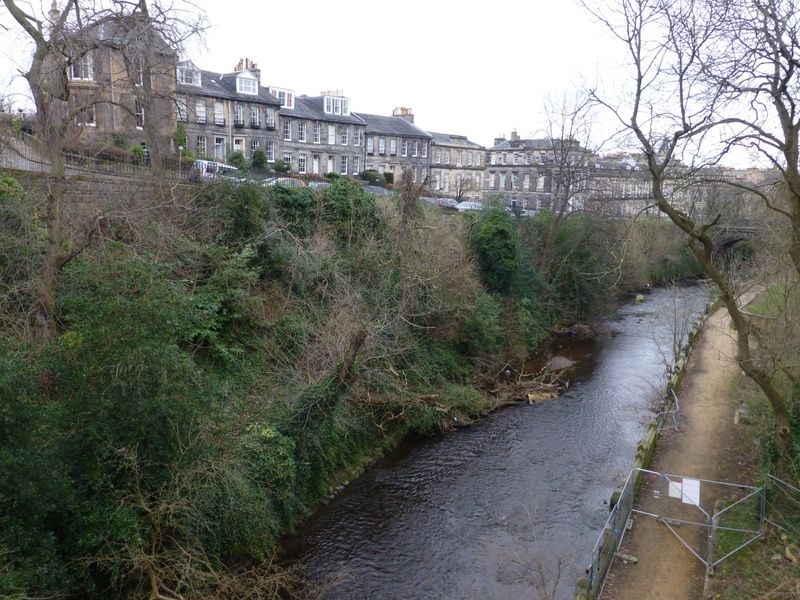 This was originally the site of 'Jericho', built 1619, a six storey granary used by the Baxters of Dean Village. The Baxters' stone was removed from Jericho and incorporated into the north-facing wall of Kirkbrae House on Dean Bridge, when it was expanded in 1893 by J Graham Fairley at the behest of its then owner, Cabbie James Stewart. On the right is the site of Lindsay’s Mill (built 1556), on which there are three millstones. The stones are a very hard quartz, originating from a quarry in Normandy. Note the curved grooves, cut into the stone, to assist the passage of flour and husk to the exterior. Water taken from the nearby weir powered the mill. The Great Lade took the water from Lindsay’s Mill to Mar’s Mill and Greenland Mill and on down to Stockbridge. Continuing up Miller Row, you emerge into Dean Village itself. On the left is the ochre coloured building of the Baxters' Tolbooth, built 1675. Straight ahead is the oldest building in the village, Bell’s Brae House. Over the bridge is the Schoolhouse on the left and West Mills on the right. In the playground at the junction of Damside and Dean Path, there is an information board describing the various features in the village.